If you are looking for a subcompact crossover that will help your family stay safe, come by Fred Mueller Mazda to get more information about the Mazda CX-3. This vehicle is one that is outfitted with some features that will help you look out for your family while you are driving. Do you ever find yourself drifting out of your lane when you are distracted? Do you try hard to drive well but still find yourself getting yourself in bad situations? 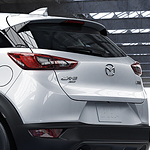 The Mazda CX-3 helps you out with a lane departure system. This system warns you if you are drifting out of your lane. If you are looking for a vehicle that is going to help you know when it is safe for you to switch lanes and when you should stay where you are, the Mazda CX-3 may be the right choice for you. This vehicle has blind spot monitoring help that it offers to you.